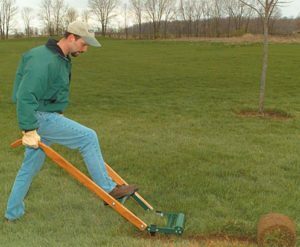 A sod cutter is a machine that has an oscillating “knife” with an adjustable depth. The knife cuts the grass off below the roots in a long strip that can be rolled up into “spools”. The soil below the cut is relatively undisturbed in the process. Sod cutters come in several sizes including a riding version. You should size the machine to your project. The depth of the cut will depend on the type of soil, the type of sod, and the moisture of the soil the day you will cut. Mastering a sod cutter can take a bit of trial and error for the weekend gardener. Tip – don’t rush this! And don’t be too hard on yourself at first. Your first attempts might be a little patchy, but you can soon cut perfect passes and curved bed edges with a bit of practice and patience. It is much easier to cut straight strips than to follow a curve. Establish a starting point that will give you a long straight cut across the bed, even if the edges of the bed will be curved on the finished bed. Cut the first strip, make a U-turn, and cut a pass back the other way lining the knife of the sod cutter up with the edge of your last pass. Repeat this until all of your straight cuts are completed. After you have cut the sod free from the soil, you will need to roll it up or cut it into manageable sections, remove it, and set it aside. Now you can make the cuts that will establish your curved edges. The spools of turf you have removed can be transplanted to another area in your yard or donated to a friend or neighbor who can use it. It can be put on Craiglist if you wish. (Do I need to put a personal safety disclaimer here? – Practice common sense safety when using these sites and contacting virtual strangers). If you cannot send it off to a new life, you can compost it by turning it over (grass side down) and letting it slowly die and decompose. If you are not in a rush, and you intend to till the area as part of your bed prep, you can turn it over in place. After the grass dies you can start tilling. One warning about this is that this will not remove the “nuts” of any nutsedge that remains in the turf.